The Observatory was constructed off the back of a garage with an unfinished attic area. The garage was dormered and finished for a control room and a new structure added for the dome. The dome is a Home Dome brand dome. The pier the telescope sits on needed to be completely unattached to any structure so as to avoid wind or people generated vibrations. 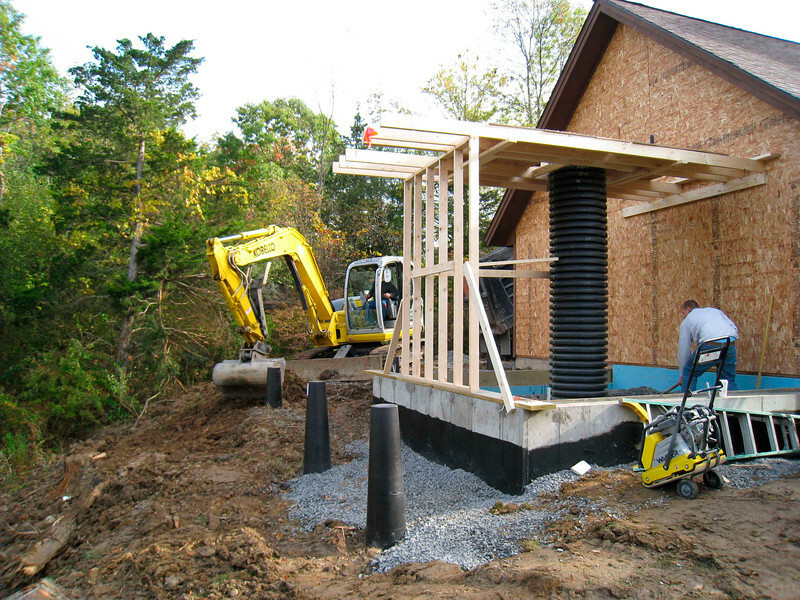 A 6'X6'X1.5' concrete base was installed in ground, from which a 15' by 2' in diameter circular cement pier was built (all with rebar support inside). This brought the top of the concrete pier to the floor of the dome room. Four mounting bolts were imbedded, based on specific design and angle consideration, when the concrete was poured. These were for mounting the base of the metal pier section that would lead to the telescope's mount. The rest of the structure was completed and the dome was lifted, preassembled, on to the top. The finishing work was then completed, including complex wiring and a blower system to circulate air into and out of the dome area. The entire system is set up to be remote controlled. I did the design work and had an expert review them before construction began. Design ideas were found in various places on the internet and in books available, including designs posted on the web for Stargate observatory and design notes by Dr. Frank Melsheimer of DFM Engineering. Dino DiBenedetto of Premier Properties did the construction work. Road conduit was used as the form for creating the concrete pier. 2' conduit was used and then cut away once concrete had hardened. Pier approximately 15' in height from base.